iPod Nano 6th Generation - Why I love/hate it | Johns iPhone | iPhone Blog with Help, News, Tutorials, Tricks, Tips, and More! 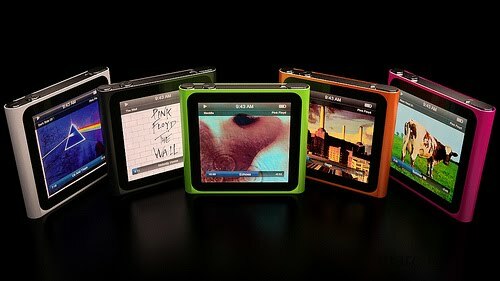 The iPod nano 6th is the latest entry into the legendary iPod family. As with many of its predecessors, this nano is all it’s cracked up to be, and not, all at the same time. If you’ve played with one of these (and I’m pretty sure you have by now) this thing is TINY. I mean so tiny it should be perfectly suited for children ages 3 and up. Having come from the 3rd gen, which was somewhat beefy, to this thing was a bit of a shock and took A LOT of time to get used to. Like many iPod users, I grew up on the click wheel and had gotten used to that. With this new touch screen, things changed, big time. As it so small, my big hands don’t quite mesh well with this new design. Since there’s no home button or click wheel, you have to swipe right in order to go back. Kind of irritating. Overall though, the new design is starting to grow on me. The size, albeit extremely small, is also extremely convenient since it takes up hardly any space in your bag, purse, or pockets. The touchscreen/swiping does take a little while to get used to but, it’s slowly starting to become convenient for me now. If you’re still a fan of the click wheel, you’re probably better off getting the 5th Gen Nano. If you want something a little niftier, might wanna check out the 6th gen Nano. lol actually idont think it would be suited for kids 3+ cause they could either break or choke on it…. @_@ plus i dunt think 3 year olds need ipods lol. Swiping to go back isn’t so bad but if you want to go directly to the home menu just press and hold on the screen for a little bit. I was bought this device for Christmas. At the moment I hate it. The battery has run down twice as although I keep turning it off, it is not fully turned off. It is unnecessarily complicated with its different modes. I just want a button that if it is an off button, does just that! Can anyone help as at the moment I want to bin it. Just hold down the sleep/wake button until the screen turns off. Congratulations, you’ve now turned it off, instead of putting it to sleep. To turn it back on, just hold down the same button again.